If you are familiar with me or with Codekarate.com, you know that one of the core goals is to help Drupal developers, designers, and site builders learn and improve their Drupal skills. Another one of my goals is to work to improve Drupal and the entire Drupal ecosystem. There is no better way to do that then to start getting more people involved with Drupal at a younger age. Most people getting started with Drupal, learn first how to build a Drupal website and after that learn about the Drupal community and how they can give back (this was true for me). This is completely backwards! With Drupal curriculum taught directly in High Schools, when students are first learning how to build web sites, WE can teach them about the Drupal community and open source communities in general. We can show students how to give back to the Drupal community and help to improve Drupal. We can build lessons in the high school curriculum where we show them how to do this (reporting/fixing issues in the issue queue, adding documentation, etc). Drupal is already great... but there is always room for improvement. While Drupal continues to grow, we have to stop to think if we are growing Drupal in the right way. If Drupal users grow at a much higher rate than Drupal contributors, we will run into serious problems in the long term. We can fix this by providing high school students interested in website design and website development with not only a solid foundation of Drupal skills, but also an education in how to contribute back. Contributions to Drupal are great ways for students to build out their resumes and development experience early. Think about it, if you are a Drupal agency/firm looking to hire Drupal talent, wouldn't you be pretty interested in a candidate that started contributing to Drupal while still in high school? I know I would. Getting Drupal curriculum into high schools is not going to have a huge impact on Drupal and the Drupal community today. This is a long term solution. It will take time to develop the curriculum, time to get the curriculum into schools, time to train the teachers correctly, and time for students to actually learn enough about Drupal to start contributing. Many of these students will not be in the professional world for 4 or 5 years... that is a long time to wait to start seeing significant results... Despite the long timeline, the risk of not doing something is much greater. This is about building a bigger, and BETTER (notice the emphasis on better) Drupal community. By building a bigger, better, more thriving Drupal community, we all win. With more and more companies adopting Drupal, the Drupal skills you know and will continue to learn will prove even more beneficial for finding Drupal related jobs. More Drupal users, means more Drupal work available, this means overall more Drupal related careers will be created. This also bodes well for Drupal services companies. If you are a Drupal training company, there will be more Drupalers needing training, if you are a Drupal hosting company, there will be more Drupal sites that need hosting, and on and on. You might be wondering if teaching students will really have this big of an impact. After all, how much do you remember and use from high school? If you answered, "not much" or something similar, then you can see why this is so important. By building more relevant, more engaging, project based curriculum, we can teach students skills that are directly applicable to the "real world". How many students will this affect? Well if we can get this into 2,000 schools, in the next 24 months, and each of these schools only teaches a single Drupal Web design/development class a semester, with an estimated classroom size of 16 (which may actually be a little low). That is 32,000 additional students learning about Drupal every single semester, this is 64,000 a year. Now imagine we wait 5 years, and the number is closer to 10,000 schools, now the number of students could be 320,000 per year... that's a lot of new Drupal.org members! Just for the sake of guessing, lets assume we can only get 10% of the students to be Drupal contributors. Lets guess that 30% will build a Drupal site themselves after the class is over. Finally lets guess that 60% will never build a Drupal website themselves again (which seems like a really high number to me). What do you think those 60% are going to recommend if asked how to build a website by a friend? What if one of these 60% becomes a business owner and needs a website.... doesn't it makes sense that they will look for a Drupal company to build this site for them (since they are already familiar with how it works)? The numbers really are striking when you think of the long term implications. You might be wondering how it would be possible to get this into 2,000 schools in the next 24 months? I am the Chief Technical Ninja (basically the CTO with a more clever title) of STEM Fuse. We build and distribute STEM (science, technology, engineering and math) curriculum. We are currently in over 2,500 schools (mostly high schools but some middle and elementary schools). There have always been plans to build web design/development curriculum to add to our suite of 14 full semester courses (with more on the way). However, I have convinced the entire team to not only be better with our web design/development curriculum but to also be different. We are trying to build this curriculum to be truly different than anything that currently exists for website design and development in the K-12 education system. We want to find a way to give this curriculum away to high schools for FREE. This way we can ensure we get it into schools as quickly as possible and can start making a positive impact on Drupal and the Drupal community sooner. To do this we decided to launch a Kickstarter campaign. This will allow us to fund the process so we can develop the curriculum, give the curriculum away to high schools, and offer free teacher training to ensure each student is taught in a similar way. This also allows us to work with multiple Drupal companies to ensure these companies and the entire Drupal ecosystem is accurately represented directly within the curriculum. You can also help by sharing this blog post, the Kickstarter page, or anything else related to this BIG initiative. Tell your friends, your family, your social networks, and anyone else you think might give you the time of day. I know that this will not happen without your help. I want to work with as many of you as possible to figure out not only how to make this happen, but how we can work together to come up with ideas to build a revolutionary website design curriculum for high schools using Drupal. 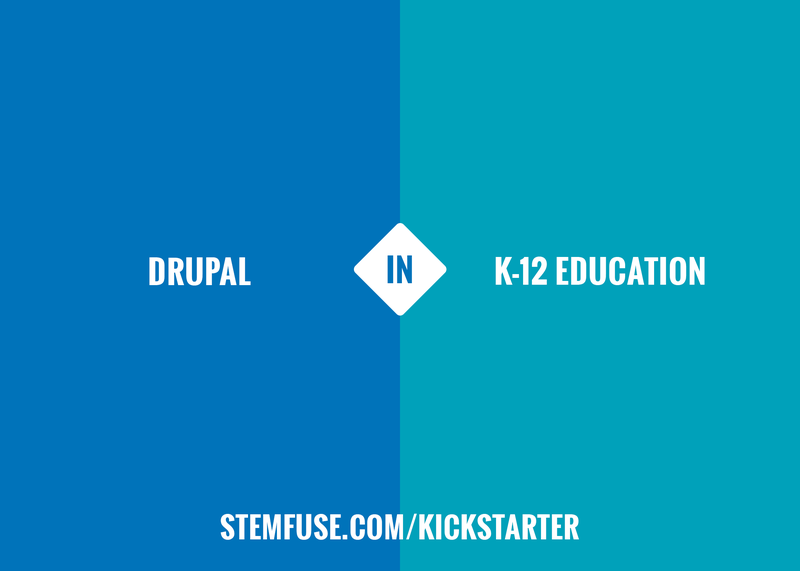 Will you join me in my mission to get Drupal into 2,000 high schools in the next 24 months?